With three-tenths of a second lead after the first run, Mikaela Shiffrin went into the afternoon as the clear favorite in Sunday’s World Cup slalom at Kranjska Gora, Slovenia. She’s typically able to seal the deal under those conditions, but with an uncharacteristic mistake prior to the first split, the second run was over as quickly as it began for the 18-year-old. Early on a snowy course (the GS was canceled Saturday), Shiffrin hit the bottom of a rut head-on and was dramatically thrown forward over the front of the skis. She then entered a flush on a flatter section of the course where she had to pole to regenerate speed. By the next split, Shiffrin had lost more than seven-tenths to Frida Hansdotter. The mistake seemed to rattle the American as she lost another three-tenths on her way to a seventh-place finish. For Hansdotter, whose coach set the second run, the win is a long time coming. The 28-year-old Swede has finished runner-up in eight World Cup slalom races, several of which were behind Shiffrin. With a 144-point lead heading into the day, Shiffrin was mathematically in contention to lock up a second straight World Cup slalom title Sunday — a handful of her key rivals, Hansdotter included, would have needed to miss the podium. Instead, the slalom standings heat up with two races on the World Cup calendar remaining: Shiffrin still holds an 80-point lead. The Austrian Schild sisters rounded out the podium — the older of the two, Marlies, snatching up second as Bernadette, who improved from 10th after the first run, finished third. The younger sister, 24, had a couple bobbles in her second effort, but that was par for the course, and she managed to let the skis run toward the bottom for a fast time. Marlies, racing against the pace set by her kid sister, enjoyed nearly a full-second advantage out of the start. She gradually lost time throughout her run but managed to hang on to the final tenth for a second-place result. Hansdotter was the first and only racer to gain time at the top of her second run over Bernadette Schild. She hit the steeps and nearly went back over the tails of her skis on a delay gate, but managed a beautiful recovery for the win. Canadian Erin Mielzynski, who was sixth after the first run, dropped back to 14th but still posted her best result of the season. Resi Stiegler, who will be on her way to Sochi this week, was the second-best American, missing second-run qualification in 31st position by just three-hundredths of a second. Brittany Phelan of Canada produced her third scoring result of the season, finishing in the points in 24th. Women’ World Cup slalom, Kranjska Gora, Slovenia, Feb. 2, 2014. … It is the 23rd of 32 races on the women’s schedule. … The sixth of eight slated slaloms. 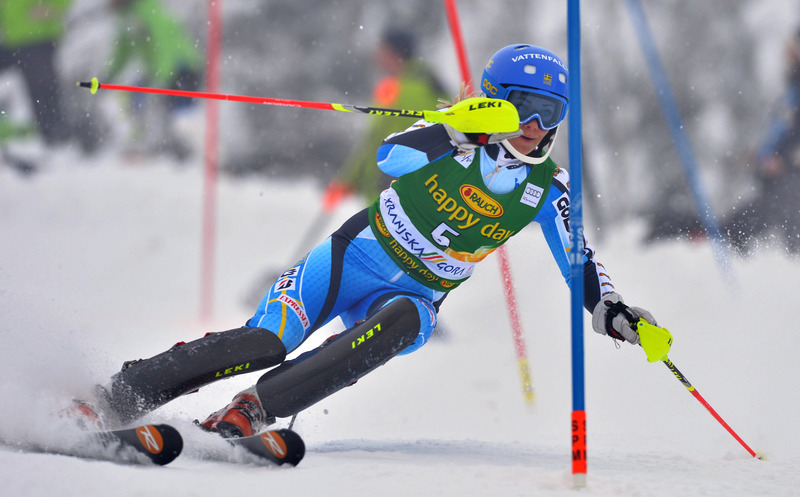 … it is the 79th World Cup race hosted at Kranjska Gora… the first women’s slalom since 2012. It is the first career World Cup win for Frida Hansdotter, though she has registered eight second-place finishes, all in slalom and two of them this season. … She is the 16th Swede to win a World Cup slalom. It is the 70th World Cup podium result for Marlies Schild… her third at Kranjska Gora. It is the third career World Cup podium for Bernadette Schild… her second of the season, all in slalom. It is the 27th World Cup top 10 for Mikaela Shiffrin in 33 completed races. … Erin Mielzynski matches her ninth best career World Cup finish. … It is her best finish of the season. … It is the seventh best of ten World Cup scoring results for Brittany Phelan. Maria Hoefl-Riesch (23rd in race) leads the World Cup overall standings 1071-943 over Tina Weirather (did not race). … Anna Fenninger (did not race) is third with 871pts. … Mikaela Shiffrin is sixth with 650pts. … Marie-Michele Gagnon (DNF) is ninth with 453pts. Shiffrin leads the slalom standings 438-358 over Hansdotter. … Marlies Schild is third wth 325pts. … Gagnon is fourth with 206pts. Austria leads the women’s Nations Cup 4200-2306 over Switzerland. … Sweden is third with 1936pts. … The U.S. is sixth at 1366pts and Canada tenth with 742pts. - Geoff Mintz is a former alpine ski racer who cut his teeth at Ragged Mountain and Waterville Valley, N.H. After graduating from Holderness and UVM, he relocated to Colorado, where he worked as an instructor at Beaver Creek prior to pursuing a career in journalism. Ted Ligety crushes the field by over a second and a half in the final World Cup race before the Olympics. Noticeably absent from the list selected by lottery is a single course setter from the U.S. Ski Team.